Bell Basil Mada Bicycle Seat Bag, Black by Basil at Joes V Cycle. SKU: 207894. MPN: 160862. Hurry! Limited time offer. Offer valid only while supplies last. The Basil Front Carrier Bicycle Rack is a robust and large front carrier, with stays for mounting on the front axle and two handle bar hooks. The Basil Front Carrier Bicycle Rack is a robust and large front carrier, with stays for mounting on the front axle and two handle bar hooks. 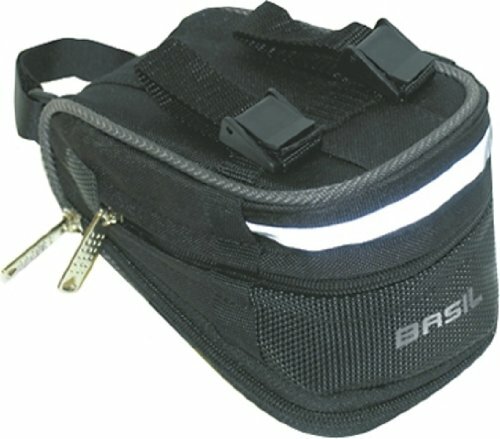 Includes fastening eye for cycling head lamp, for loads up to a max weight of 22lbs. If you have any questions about this product by Basil, contact us by completing and submitting the form below. If you are looking for a specif part number, please include it with your message.